SAIC Capital Invested in Flaircomm Microelectronics Inc. to Jointly Build the Ecological Circle of -Flaircomm Microelectronics,Inc. 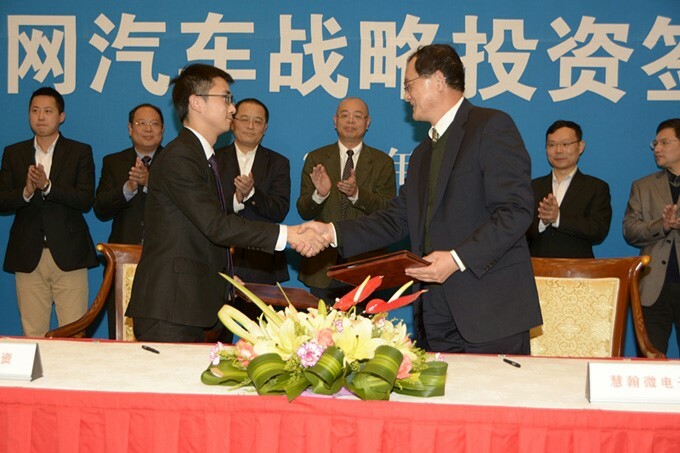 On December 25, SAIC Capital Company Limited (SAIC Capital) and Fujian Flaircomm Microelectronics Inc under Gomine Group signed a strategic investment signing ceremony in Fuzhou, which was a cross-border cooperation between both sides to jointly build an ecological circle of the telematics. At an earlier time, Flairmicro had provided independent brands of SAIC such as Roewe, MG and Maxus with core technologies such as Telematics Control Unit. At present, Flairmicro is developing the next generation of core technologies of telematics based on 4G-LTE for SAIC Group. With the investment of SAIC Capital in Flairmicro this time, it will strengthen the cooperation between both sides in all aspects and promote the development of China's telematics industry to a certain extent. According to the forecast jointly released by Google and Tesla, by 2015, there will be 6.6 billion interconnected objects in the world, which include 62 million interconnected vehicles. Vehicle will become the third interconnected object following computer and smartphone. The telematics is believed to be the most revolutionary reform in the development of auto industry for more than a century and will usher in a moment of widespread outbreak. So far, China has the globally largest auto market, with an inventory of near 140 million vehicles. It's predicted that the global scale of telematics industry will exceed 100 billion US dollars and the domestic scale of the industry will exceed 100 billion Yuan. The core product of Flairmicro--Telematics Control Unit, as a core device and standard configuration mounted on the vehicles, has a promising prospect, with a market capacity predicted to exceed 10 billion Yuan by 2020. Four years ago, Gomine Group entered the telematics industry in a low-key manner. Nowadays the global auto electronics field has been monopolized by giants of the world such as Visteon, Delphi, Bosch and Haman. Gomine has chosen another path--telematics and has sprung up in the telematics industry depending on China's innovation advantages of low costs and high reliability. The investment of SAIC Capital in Flairmicro this time is an effective combination of industry and capital and also stands for the grasping of forward-looking auto technologies and development trend of the industry by auto manufacturers. Both sides has established a solid strategic partnership through equity cooperation, which will help shorten the R＆D period of telematics products, meet the demand for a quick response in the era of Internet and effectively boost the construction of the ecological circle of telematics industry. The signing ceremony was attended by General Manager of SAIC Capital Lu Yongtao and president of Gomine Group Chen Guoying and other staff. Telematics is a major branch of Internet of Things, which integrates the vehicle body network (CAN/LIN), in-vehicle network (Bluetooth/WiFi), inter-vehicle network (802.11p) and mobile Internet (2G/3G/4G), so that the vehicles are no longer a mobile isolated island and it can realize V2X, namely, inter-connection between vehicle and vehicle, roads, pedestrians and the Internet. As a wholly-owned subsidiary of SAIC Motor, SAIC Capital is mainly engaged in direct equity investment, including venture capital investment related with the industrial chain of automobile, equity investment, Pre-IPO, acquisition and reorganization and PIPE investment business, currently managing a capital of approximately 8.5 billion Yuan. It is also an investment platform of SAIC Motor targeting the forward-looking technologies of auto industrial chain and innovative business models, focusing on the business models related with new materials of automobile, energy-saving and alternate energy automobiles, auto electronics and telematics, after-market and the Internet. SAIC Motor is the largest automotive group in China (stock code: 600104), comprising major whole vehicle enterprises such as SAIC Motor Passenger Vehicle Corporation, Commercial Vehicle Corporation, Shanghai Volkswagen, Shanghai General Motor, Shanghai GM Wuling, Nanjing Iveco, SAIC Iveco Hongyan and Shanghai Sunwin. In 2014, SAIC Motor was listed into the Fortune 500 for the tenth time with a sales revenue of 92.0248 billion US dollars in 2013, ranked 85th. Fujian Flaircomm Microelectronics Inc is an innovative company committed to the R＆D of high reliability and low-cost Internet of Things technologies, especially core telematics technologies under Gomine Group. The core R＆D team of the company has a background of Lucent & Bell Research Lab. Flairmicro has supplied before-market Telematics Control Unit to domestic automotive manufacturers such as SAIC Motor, Chery, JAC, Beijing Auto, Beiqi Foton and ZOTYE Auto; and also supplied before-market blue-tooth/WiFi telematics modules and embedded software products to auto electronics manufacturers at home and abroad such as Clarion, Fujitsu Ten, Pioneer, Desay SV Auto and HSAE.